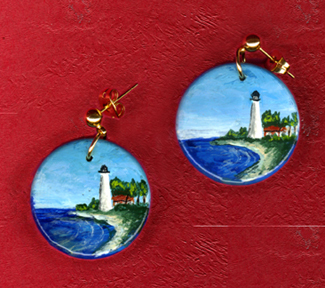 These earrings are original acrylic miniature paintings on wood with a clear polyurethane finish and measure 1 inch circle. The earrings have gold plated ball post and ear nuts. The back of each earring has been painted, signed and dated by the artist. The paintings are of the St. Marks Lighthouse . This lighthouse is located in the St. Marks National Wildlife Refuge in Florida. It was built in 1831 and is still an active light.